"Oh, what big teeth you have!" is usually not what you expect to hear when someone sees a baby for the first time. That's probably what you would expect to hear when someone first sees a horse, a beaver, or a grizzled champion sweet corn eater, but not an innocent baby human! However, history has proven that not only is anything possible, everything has probably already happened, and many times. But, on the off-chance there actually hasn't been a huge-toothed baby yet, you can get ahead of the curve with this Two Front Teeth Pacifier! 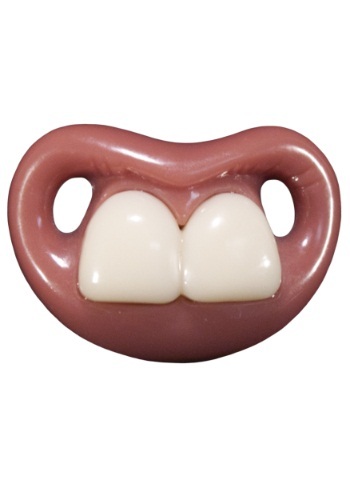 Everyone will be doing double-takes as they see this big, cartoonish, buck tooth grin on your baby's little face. It's made of BPA-free plastic, so luckily these chompers don't require any flossing or brushing. Think of all the conversations about infant costumes and baby orthodontia it'll spark too.